We offer 2 different brands of 4340 Forged Con rods for the Mits 2.6. 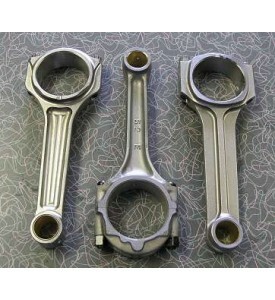 Both are very strong and more than 5 oz's lighter than the stock rods. 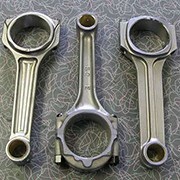 Either rod will hold up to 200 HP PER ROD so you are safe no matter what modifications you do to your engine for Street or Race. Note: We NO LONGER Carry the PAR Rods. Only the Pauter Rods. Due to Quality Control Control concerns and an increase in shipping costs it is more cost effective to only offer the Pauter rods. They are IN STOCK to ship. All contents on these pages 1998-99 by Top-End Performance and Steve Nelson. No portion of these pages may be reproduced or re-published in any form without the express permission of Steve Nelson and Top-End Performance. This does not include links to other pages and downloads for personal use. We encourage that. In other words... Don't bag the pictures and text and put them on a site or in a sales or service catalog or otherwise pretend that they are your own.